It's always a little bit magical to see one of our famous native animals in their own habitat. Rather than visit a zoo or wildlife park, where are some spots where you can find beautiful birds, slippery sealife, or even better, some of our adorable marsupials in their own home? I love watching birds - I'm lucky enough to live in an area with enough trees to hear little chirps and tweets, and the raucous squawks of the lorikeets in the afternoons! There's also flying foxes that hang out in the berry trees near Stanmore station at night, you can get quite close to them and see them really well. I've also spotted a few ringtail possums around the grounds of Sydney Uni, scavenging for food after everyone's gone home for the day. So cute! The CBD and Inner West, however, aren't the greatest spots to see wild animals. If you want to see and hear a huge range of birds, and maybe if you're lucky some tiny marsupials, head to the Blue Mountains and go on a hike along any of the gorgeous trails. You could get lucky and see some wallabies! I've also heard that the Manly ferry can be a good start to spot whales and dolphins, as they don't come close enough to the main Sydney Harbour for you to see them from any of the other ferries. My favourite - Taronga Zoo! 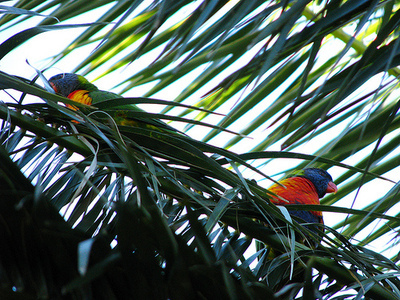 I often see rainbow lorikeets (like in the image) around the food areas in The Rocks. They'll even come right up close to the tables people sit at, hoping to get a little bit of food! Unfortunately, there's little to no wildlife in my area, we've only got pigeons, cats and the occasional bat. So when I want to see local wildlife, I go to the Sydney Wildlife Park in Darling Harbour. It's got amazing exhibits, with mammals, birds, insects and reptiles. Some of the standouts are the kangaroo exhibit, where you're just an arms length away from the surprisingly big animals, and the butterfly room where beautiful butterflies might land you if you're still enough! I found the Sydney Walkabout Wildlife Park in Calga to be an amazing opportunity for seeing wildlife. Not only can you see the animals up close as you walk amongst, some you can even pet! It was at this wildlife park that I petted my first ever kangaroo. However, the park focuses on Australian Wildlife, so do not expect to see as many animals as you would in a place like Taronga or Dubbo Zoo. Also note that prices are relatively cheap. Best free pool tables in Sydney? Best craft beer venue in Sydney? Best pub trivia night in Sydney?